The Run to End the Runs kicked off last weekend with the Santiago marathon. When the horrible earthquake hit Chile in February, we thought that perhaps they would cancel the race. But no-the country decided to use the race as a rather unconventional way to show their solidarity to the people affected by the earthquake. 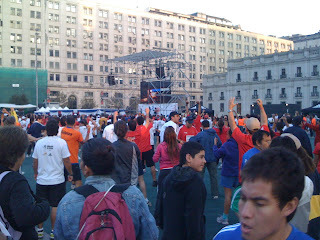 Following a ear-shattering, aerobic warm up led by a popular Chilean celebrity, everybody was corralled into different areas by race type so that we could form a Chilean flag by the colors of our shirts. Over 20,000 people ran the three races: a marathon, half marathon, and 10km. Each race had its own colored shirt-the marathoners wore blue, the halfers white, and the 10kmers wore red. 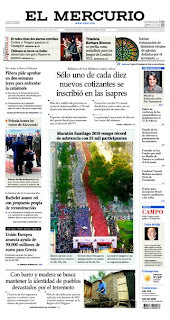 We were part of the largest human Chilean flag and even made front page news. The race was impeccably organized, even the street dogs that accompanied us for most of the race were well-behaved. I'm used to running on trails and having run ins with rattlesnakes, tornadoes, lightning, and injuries from tripping over big rocks. Running a city marathon like Santiago felt comparably drama-less compared to some of the trail events over the years. I did go out fast and saw the 3:45 pace truck pass me near the half way mark. I hit the wall hard and finished slowed than I wanted -4:22, but that is the beauty of 12 marathons in one year-always the chance to do better! Matt came in at 3:48 after hitting his own wall and seeing that 3:45 sign on the bike pass him at the very last moment. It was a great, easy start to our quest to stem sanitation poverty (i.e. helping people access toilets) this year through the Run to End the Runs. The new website is up and running: www.waterforpeople.org/runtoendtheruns- stay tuned for updates!